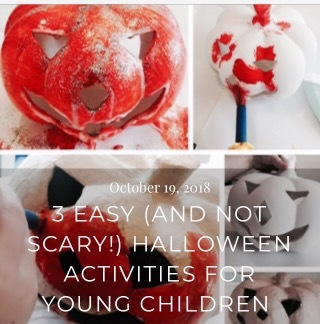 If you’re keen to introduce a few Halloween activities to young children either at home or at your nursery/school or preschool, but like me..don’t want to scare them at all, then have a look at our top 3 Halloween Activities for Young Kids. Also fantastic for any Halloween themed parties! 1. Potion Making– This is my absolute favourite. Kids love it! Easy to set up and provides hours of fun. We did two different versions indoor and outdoor. For the indoor one we used Collage bits and bobs like glitter, sequins, coloured water and beads (under supervision) and for the Outdoor version we went for a scavenger hunt to find leaves, petals, grass etc to put inside. The children loved mixing, pouring and squirting the liquids with the pipettes! The little glass potion bottles we used were from Hobby Craft. 3. Halloween Baking– Kids love baking, especially when icing is involved! We made it really easy by using one of the Betty Crocker kits and premade Renshaw Icing from Hobby Craft. Cut the icing into circles, put them on top of the buns and then decorated with writing icing to make them look like pumpkins. Brilliant for practising those pre-writing skills using the writing icing too! *Please note we were sent some products for review; however all thoughts and opinions are our own.